After seven years of war, an estimated 86,000 Syrians are coping with losing a limb to amputation, according to the World Health Organisation and disability charity Handicap International. IRIN recently spent a day in neighbouring Jordan, exploring how 3D printing technology can produce a new generation of replacement limbs that are more comfortable and adaptable than traditional prosthetics. Patients come from Syria, Yemen, and Iraq. Many have had amputations following war injuries. Local Jordanians are also patients, some with congenital conditions. The Médecins Sans Frontières (MSF) Foundation, which supports medical and humanitarian innovation and research, funds the 3D project. Its director, Clara Nordon, says she particularly values the lessons learned from real-world field testing: “We see it as our duty to bring scientific evidence to what remains until now, a feeling.” She says the project will only claim a product is successful “when it's proven valuable by our patients”. A conventional replacement arm is heavy, and where it attaches to the stump, can become painful and sore. They can also be clunky and unsightly, and slow to deliver. Lower arms and hands produced with 3D printing, however, have offered encouraging results in terms of speedy production and comfort and ease of use for patients. The €150,000-a-year 3D pilot scheme is bringing hope of more practical alternatives to conventional artificial limbs (prostheses), ones that can be tailor-made to the client: children can have upgrades as they grow; they can be painted and coloured; extra fittings can be snapped in and out; they can be made in unusual shapes and sizes. After only its first year, the project is also reporting early benefits in using 3D printing to make face masks to ease the healing of burn patients. The International Committee of the Red Cross, which provided prostheses to more than 22,000 conflict-affected people in 2016, sees potential in 3D printing. It already uses 3D technology to develop and field test prosthetic components, explains ICRC’s innovation lead, Nan Buzard. However, Buzard notes that before the technology can be more widely used regulatory questions must be addressed, as assistive medical devices must pass international certification in many countries. ICRC also notes that so far there are limitations in using the technology for lower-limb prostheses, which must be stronger than those manufactured for upper-limbs; 95 percent of ICRC’s amputee patients have lost all or part of their lower limbs. NGO Handicap International has tested 3D printed sockets on a few below-the-knee amputees in Madagascar, Syria, and Togo. While patients offered positive feedback, costs were higher than conventional methods. (MSF, however, reports deep cost savings on manufacturing the prosthesis.) The experimental sockets, produced by a company based in the UK, met “structural and medical requirements,” Handicap International reports. In a study of the technology, it suggested further evaluation of a number of issues, including a review of technical training needs; cost of raw materials and workshop space; the costs of scanners and printers; and the speed and effectiveness of fittings. The photos below offer a closer look at the Jordan 3D project. Patients sometimes give up using a prosthetic – the reasons vary. They can be heavy, conspicuous, or unwieldy. Lighter, custom-made 3D printed “false” limbs could significantly improve the patient's quality of life, MSF researchers say. How it works: a 3D camera scans the patient’s arm and the image is used to manufacture a prosthesis fitted specifically to the individual. In 2017, its first year, the project fitted 17 people with made-to-measure plastic hand or arm prosthetics. The 3D project, based in the Jordanian capital Amman, runs alongside a larger conventional rehabilitation hospital. The 3D image files are sent to a commercial 3D printing firm. “It is personalised, depending on every patient,” says project manager Samar Ismail. The hands, forearms, and sockets are shipped back in as little as one day – conventional methods can take several weeks. Test runs and reject plastic hands fill a shelf at the 3D prosthetics office in the rehabilitation hospital. The MSF project, which works with researchers in France and the United States, is considering whether 3D printing can produce useful upper arms, shoulders, and elbow joints, and whether it can produce a prosthesis strong enough to replace amputated legs. It’s also testing 3D printing to make face masks for burn patients, artificial bones used in training and surgery, as well as joints and connectors. Ismail and the MSF Foundation are particularly upbeat about the “stunning” potential of the masks. After skin grafts and burn treatment, an elastic mask is usually stretched across the face. “It is not comfortable and it is not aesthetic,” Ismail says. Children sometimes refuse it as it looks grotesque. The team has started testing out a 3D printed mask. It’s transparent and only covers the affected area. It looks normal, Ismail says, and one of her patients, a Syrian girl with severe burns, refuses the elastic mask but will agree to wear the 3D printed one. A demonstration of the 3D camera scanning a hand. After passing the handheld camera over a stump, a detailed three-dimensional image is built up on the laptop computer. After editing and modifications, the file is sent to a 3D fabrication company in northern Jordan, which then sends back the unique part, made from molten plastic by a small robotic machine. Ismail smooths off the edges of a newly printed child's forearm. After trimming, the printouts are then tested for fit and comfort with the patient. MSF has turned the entire hospital in Amman into its very own reconstructive surgery centre. Some 150 patients stay here, with another 50 in overflow accommodation elsewhere in the city, as well as hundreds of outpatients. The eight-floor facility is dedicated to orthopaedic patients, many of whom have severe, life-changing injuries from the Syrian war. The institution was set up in 2006, to treat Iraqis. Some 11,000 surgeries and 4,700 patients have been treated here over the years, with new cases coming in from as far away as Yemen. Yusuf*, a Syrian man in his 40s, was injured in 2016 and has multiple injuries to legs and both arms from a bombing in southern Syria. With a better prosthetic arm, medical staff say, the hope is he can feed himself and go to the toilet alone: an “off-the-shelf” prosthetic lower arm has not been a success. He has seven children, and no family in Jordan. He hopes to return home. Here, he is being fitted for a new socket – the flexible joint between his real arm and the plastic lower arm and hand. His left arm stump was scanned, and he'll get a new made-to-measure socket. The socket is the most sensitive part: it is a separate piece that has to fit snugly on the patient’s remaining limb stump, without too much chafing or slipping: each is uniquely shaped. Once that is secure, arms and hands, with the proportions, and skin tone, based on the patient’s other side, can be attached. Beyond matching skin tone, the possibilities of personalising the limb appeals to adults and children: for example, a patient can have multiple snap-in “hands” for different purposes. “One of our patients... she’s seven, eight years old, and she was very happy that she could put on her nail polish by herself,” says Ismail. 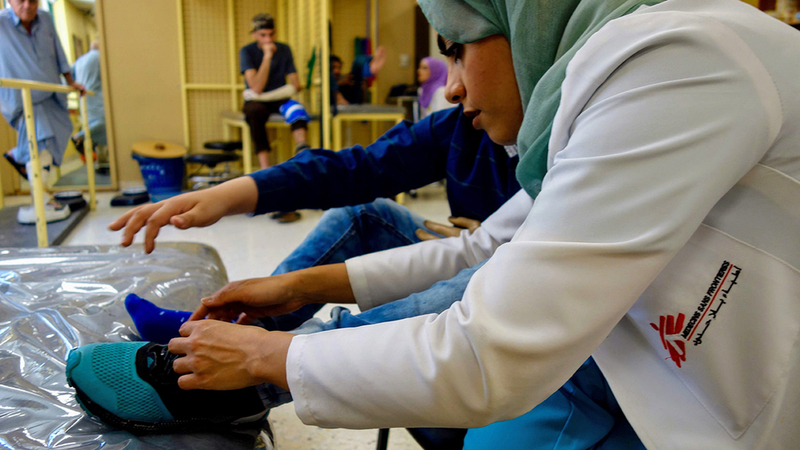 Occupational therapist Noor al-Khatib teaches a patient how to tie his shoelaces with only one hand. This patient, a Jordanian boy, had a congenital problem with his left hand. “We are not doing the prosthesis and giving it to the patient, and after that going home,” Ismail says. Specific patient needs take precedence: a patient’s goal may be to wash themselves, tie shoelaces, or tie up hair. Adjustments are made based on patient feedback. When a boy’s prosthetic forearm snapped in a fall at school, later models were made to be more robust. Battling fake news and a fading spotlight, local journalists try to keep Sulawesi tsunami survivors in the headlines. We need to counter authoritarianism and populist politics with face-to-face engagement, not smart technology, agile design, and Big Data. Severe drought has uprooted a quarter million Afghans this year. Could the aid sector and government have done more to prevent mass displacement?